The latest stable release of WordPress (Version 2.5) is now available. 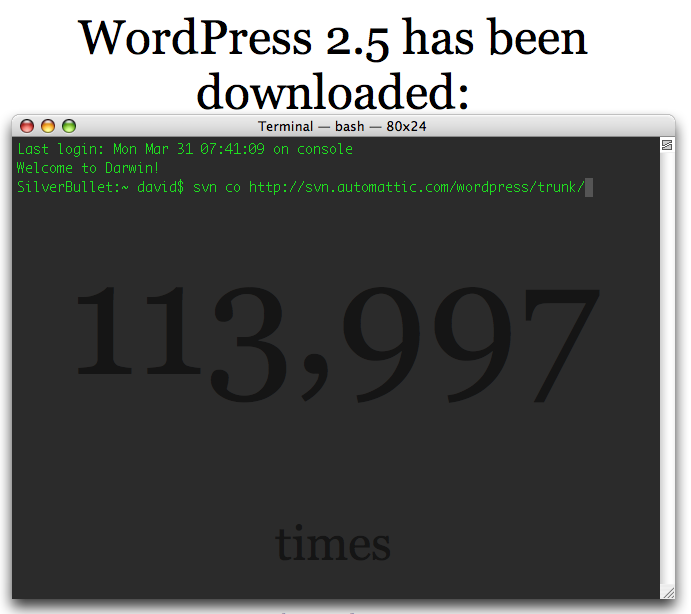 WordPress.com hosts 2.7 million WordPress blogs…and in honor of that i put up my own little space on wordpress. Let’s put wordpress into perspective for those of you who don’t understand cms (content managment systems), databases, blogs etc… it’s like this.. a database is like an excel spreadsheet (oracle, berkleydb, mysql).. and an easy way to make content dynamic on a page is to pull the database content into the webpage with a variety of scripting languages (wp uses php) so that no content or data is actually coded into the application but rather is pulled from the database. This makes it easy to update using an interface for text images, video and data etc.. here’s the six toothless kid explaining it… and my overview since i’ve run the beta for several months now…. faster, cleaner, dashboard widgets like stats, image/gallery manager with api’s, almost the same table layout, more simple/full screen wysiwyg editor, multi file uploader with progress bar, secure cookies, and faster databases.